Japan overcomes its nonproliferation jitters about India to sign a deal to provide reactors there. Vietnam pulls the plug on a plan to build eight new reactors due to high costs and lower demand for electricity. It was a roller coaster week in Asia with the sign off of a long sought nuclear deal between India and Japan for cooperation on construction of new reactors. At the same time, Vietnam, which had high expectations that the expansion of manufacturing would drive demand for electricity dashed the hopes of Rosatom, GE-Hitachi, and Toshiba/Westinghouse by cancelling plans to build eight 1000 MW nuclear reactors. In a state visit to Japan Indian Prime Minister Narendra Modi sat down with Japan’s Prime Minister Shinzo Abe to seal a deal that has been six years in the making. 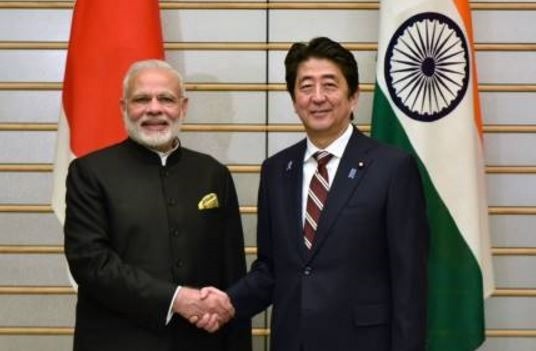 Overcoming Japanese domestic objections to the agreement, Abe said that the bilateral pact will open India’s markets for Japan’s exports of it nuclear reactors. The U.S. signed a similar pact in 2008, but no U.S. sourced reactor projects have started as a result. Japan had been reluctant in the past to sign such a deal with India because that country has refused over the past 30 years to sign on to the comprehensive safeguards regimes of the Nuclear Non-proliferation Treaty. Addressing these concerns, Japan’s PM Abe said that if India conducts another nuclear weapons test, that this would be grounds for terminating the civilian nuclear cooperation agreement. Japan’s parliament, the Diet, must ratify the pact and Abe can expect heated opposition there by members from the cities of Hiroshima, Nagasaki, as well as from Niigata (Kashiwazaki-Kariwa Nuclear Power Plant) and Fukushima provinces. Back over in India, a plan to build six Westinghouse (Toshiba) nuclear reactors in Andhra Pradesh has been simmering for at least six years. It was relocated last May to its new location after protests in PM Modi’s home state of Gujarat forced an end to the use of a site there. The coastal site was once allocated to GE-Hitachi, but that firm has more or less withdrawn, at least for now, from the Indian nuclear market over the draconian effects of the nuclear supplier liability law. It is a poison pill for any publically traded firm. The law has been driven two two nominally antagonistic energy interests. First, Indian heavy industry firms have wanted to secure the market for new reactors for an indigenous design, a 700 MW PHWR based on AECL’s CANDU natural uranium reactor. Second, India’s massive coal interests have no desire to see current or future fossil power stations replaced by nuclear reactors. Counter pressures on these interests are that India, like other nations, has made commitments to address the threat of global warming. Also, from a competitive perspective, Rosatom, the Russian nuclear export firm, has built and commercially launched two 1000 MW VVER reactors at Kudankulam in Tamil Nadu and this month broke ground to build two more. A total of six units are planned for the site. Meanwhile, financially troubled Areva, now partnered with EDF, and which launched an effort to build the first two of a planned six 1650 MW EPRs at Jaitapur nearly half a decade ago, still has not broken ground for the project. It is mired in environmental and land disputes for the site. Until India either takes the supplier liability law off the books, or spikes it administratively with a robust government chartered insurance pool, the latest reactor deal with Japan may be more a case of sizzle than steak. PM Modi is expected to seek to leverage that “sizzle” to convince other nations that India should be admitted to the Nuclear Suppliers Group which controls global trade in uranium fuel for commercial reactors. China has opposed India’s entry to the NSG. The New York Times has an insightful report on several other aspects of India’s deal with Japan including plans for Japanese firms to help India build a high speed rail line. Japan also agreed to train Indian engineers how to manage nuclear reactor technologies and to provide general workforce training in advanced manufacturing methods. In terms of global competition, the newspaper points out that Japanese firms lost out to South Korea for the construction of four new nuclear reactors in the United Arab Emirates, a deal worth an estimated $30 billion, and that Toshiba, the parent firm of Westinghouse, has been mired in an accounting scandal in which it over stated earnings by $1.2 billion. In 2010 high tech firms like computer chip maker Intel were flocking to Vietnam to build sophisticated manufacturing centers. The country’s leadership, believing that demand for electricity would continue to grow, reached out to Russia and Japan to develop a plan to add a total of 8 GWe of nuclear generated electricity to the 24 GW being produced 50% by hydro and 30% by fossil sources. It was seen as an effort to achieve an enormous leap forward, but this week the country, facing a global economic muddle, and a worrisome national debt, scrapped the entire effort. It cancelled four VVERs and four reactors to be supplied by Japanese firms due to the rising costs of the power stations in a time of global economic stagnation. The decision is all the more significant since the Vietnamese government aligns itself with Moscow as a buffer against China with which it shares a common border. According to a Wall Street Journal report for 11/10/16 growth in electricity demand in Vietnam has fallen off from previous forecasts of 17-20%/year to a new low of a steady 11% for at least the next four years. Economic growth, the main driver of demand for electricity, has fallen from an estimated 7% to about 5.8%. The U.S. National Association of Manufacturers charts show less than stellar prospects for sustained global growth. The final straw is that the country’s national debt is nearing 65% of GNP and the central bank did not want to borrow the estimated $10 billion for the first four reactors (2 from Russia and 2 from Japan) and then borrow another equal amount for another four reactors. Russia and Japan had offered favorable terms and financial assistance for the reactor deals. Contracts had been awarded for two Russian and two Japanese reactors, but their execution may now be postponed indefinitely. The result of the cancellation of all four reactors is that coal is expected to increase as a source for fuel for power generation stations from 30% to 55%. Had the four reactors been built, they would have supplied about 4% of the country’s demand for electricity. Construction of the reactors had been set to begin in the province of Ninh Thuan province in 2014. 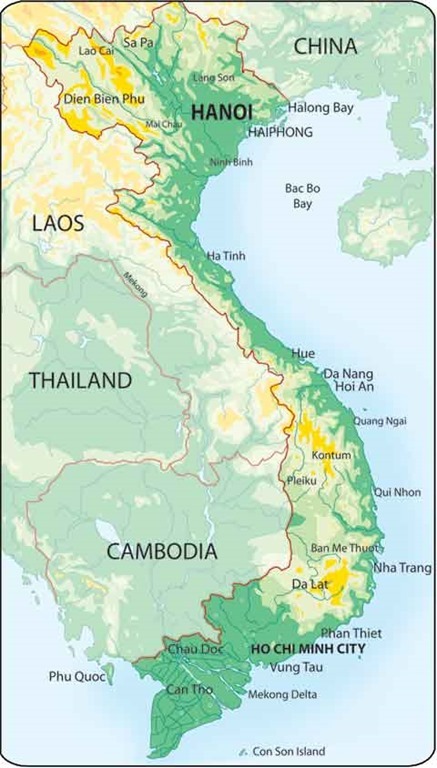 The site is about 350 km / 135 miles northeast of Ho Chi Minh city (formerly Saigon). The start date was pushed back several times by the government on the grounds that it did not have enough trained nuclear engineers to manage the construction nor the safety regulatory programs needed for a reactor development effort of this size. In January 2015 Hoang Anh Tuan, head of the Vietnam Atomic Energy Agency, told western news media that the reason for the delays is that the government isn’t ready to manage the project nor does it have a mature and independent nuclear safety and regulatory oversight agency. A national nuclear safety agency was set up in 2010, but much more work is needed according to this report. Construction of the first two units was recently set to start in 2020 and completion of the second sets of reactors had been scheduled to take place by 2028. At this point, there are no plans for nuclear reactors in the Vietnamese central economic plan through 2030. Vietnam did not consider small nuclear reactors because neither the Russians nor the Japanese have commercial units to sell them.